Many apps these days ask you to swipe right for some reason or another. Tinder is the most famous example, but it's far from the only one. Why has a left-to-right swipe become so popular? According to Jim Davies, an associate professor at the Institute of Cognitive Science in Ottawa, it's because we're hardwired to love it. 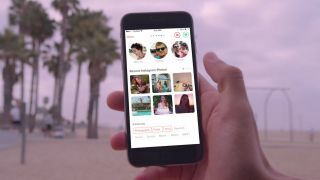 "Tinder's founders capitalized on a bit of human psychology: It seems natural that a positive feeling should be indicated with a rightward swipe rather than a leftward one," he wrote in a blog post on Nautilus. It's a trick that movie directors have known for years. Rightward motion is seen as good, and leftward motion bad - check it out in the Matrix. When Neo gets in a fight, he's almost always moving left to right. Pretty much every video game scrolls in the same direction too. But what's particularly interesting is that this is only true in cultures where people write left-to-right. "When the studies are done for pre-literate children, the effect is not there, and for speakers of Hebrew or Arabic, two right-to-left languages, we get the opposite effects," says Davies. Sure enough, Israeli action heroes run right-to-left. So the next time you swipe right, take a moment to think about how it'd feel in the other direction. Weird, huh?